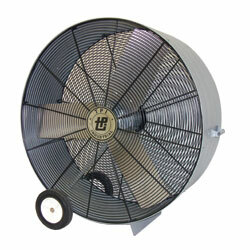 Now you can efficiently cool large areas with these heavy-duty air circulators. Durable, powder coat 20-gauge shroud with front and rear spiral guards protects the steel blade paddles. Front and rear roll formed embossments add strength and rigidity. Air circulators include: ball-bearing open drip proof motors, rocker-type switches, and 15', 3 conductor cords. Meet OSHA requirements and are UL listed. DIRECT DRIVE MODEL. 2-speed, 115V, permanent split capacitor motor. 8" hard rubber wheels. Three blades. BELT DRIVE MODELS. 1-speed, 115V, capacitor start motor. 10" hard rubber wheels. Four blades. Swivel model rotates 360° in 15° increments. IN STOCK. *2nd speed for direct drive models is 9,000 CFM.